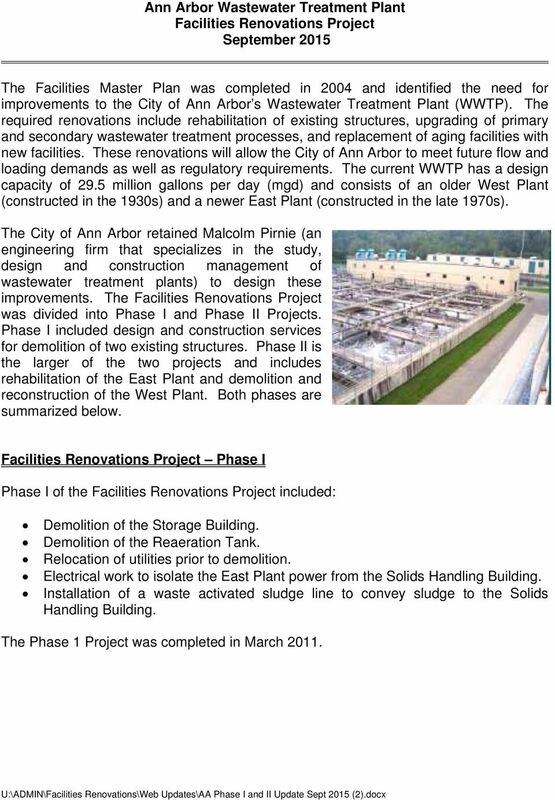 Download "Ann Arbor Wastewater Treatment Plant Facilities Renovations Project September 2015"
1 Ann Arbor Wastewater Treatment Plant Facilities Renovations Project September 2015 The Facilities Master Plan was completed in 2004 and identified the need for improvements to the City of Ann Arbor s Wastewater Treatment Plant (WWTP). 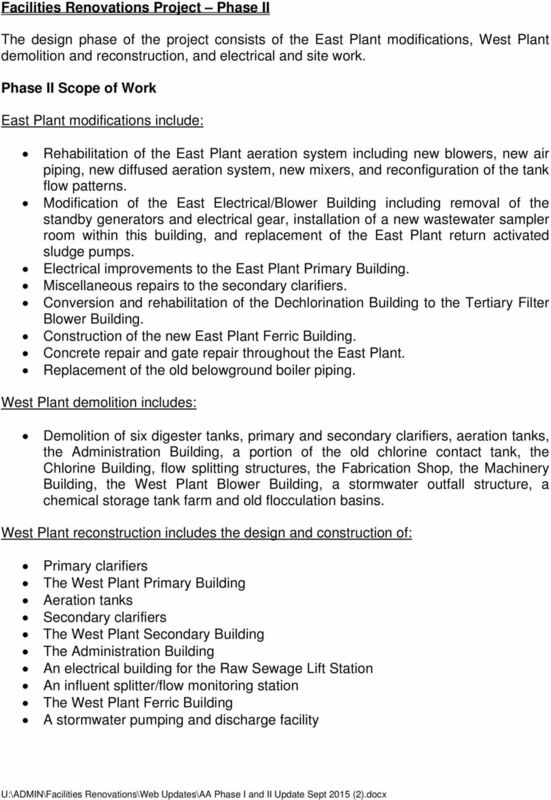 The required renovations include rehabilitation of existing structures, upgrading of primary and secondary wastewater treatment processes, and replacement of aging facilities with new facilities. These renovations will allow the City of Ann Arbor to meet future flow and loading demands as well as regulatory requirements. 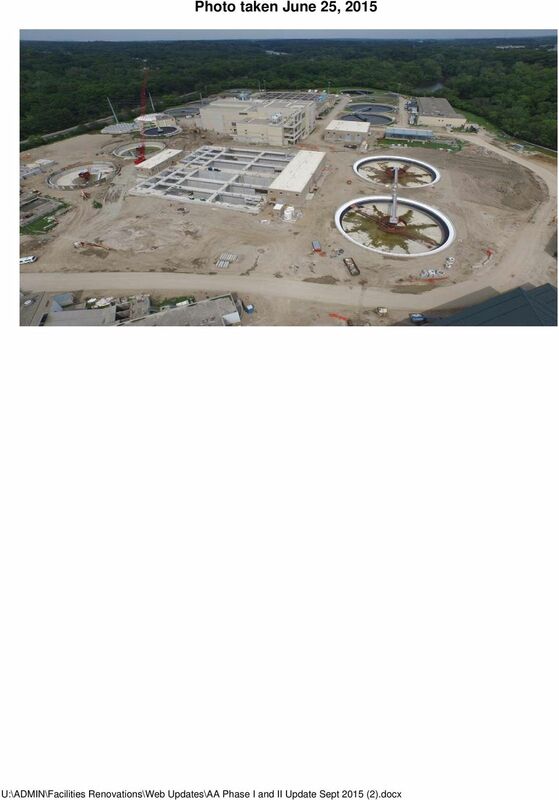 The current WWTP has a design capacity of 29.5 million gallons per day (mgd) and consists of an older West Plant (constructed in the 1930s) and a newer East Plant (constructed in the late 1970s). 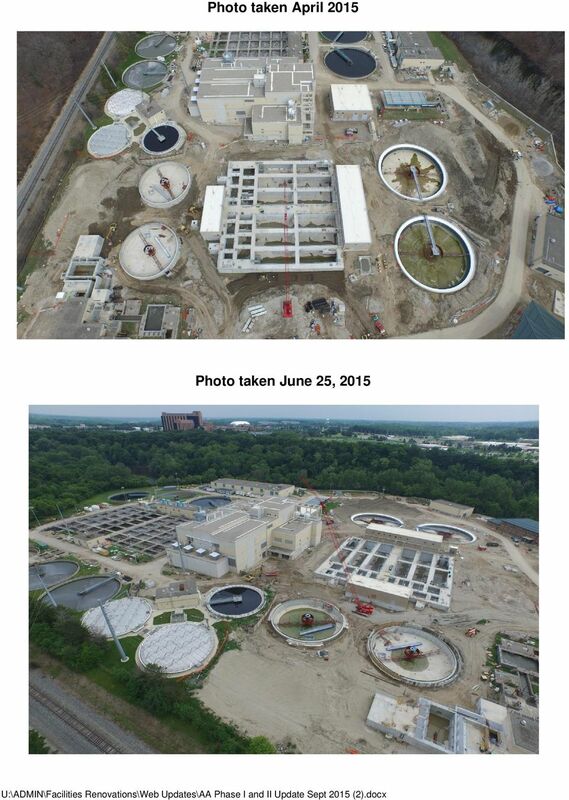 The City of Ann Arbor retained Malcolm Pirnie (an engineering firm that specializes in the study, design and construction management of wastewater treatment plants) to design these improvements. The Facilities Renovations Project was divided into Phase I and Phase II Projects. Phase I included design and construction services for demolition of two existing structures. Phase II is the larger of the two projects and includes rehabilitation of the East Plant and demolition and reconstruction of the West Plant. Both phases are summarized below. Facilities Renovations Project Phase I Phase I of the Facilities Renovations Project included: Demolition of the Storage Building. Demolition of the Reaeration Tank. Relocation of utilities prior to demolition. Electrical work to isolate the East Plant power from the Solids Handling Building. Installation of a waste activated sludge line to convey sludge to the Solids Handling Building. The Phase 1 Project was completed in March 2011. 3 Electrical and site work includes: Replacement of the existing 4.8-kV power distribution system with a 13.2-kV power distribution system plant-wide. A new Central Electrical Building. Replacement of existing standby generators with new generators located within the Central Electrical Building. Rerouting of existing site utilities. 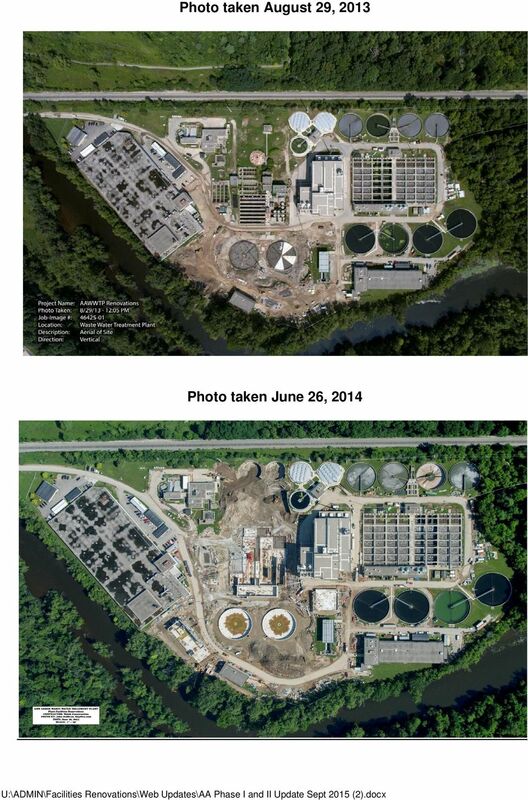 Upgrading and reconfiguration of the existing stormwater system. Upgrading of the existing earthen embankment to meet Federal Emergency Management Agency (FEMA) standards for certification. Relocation of DTE Energy power transmission lines. Installation of new roadways throughout the plant. Upgrading of the existing supervisory control and data acquisition (SCADA) system. Phase II Timeline Project Milestones The Phase II Project is under construction. 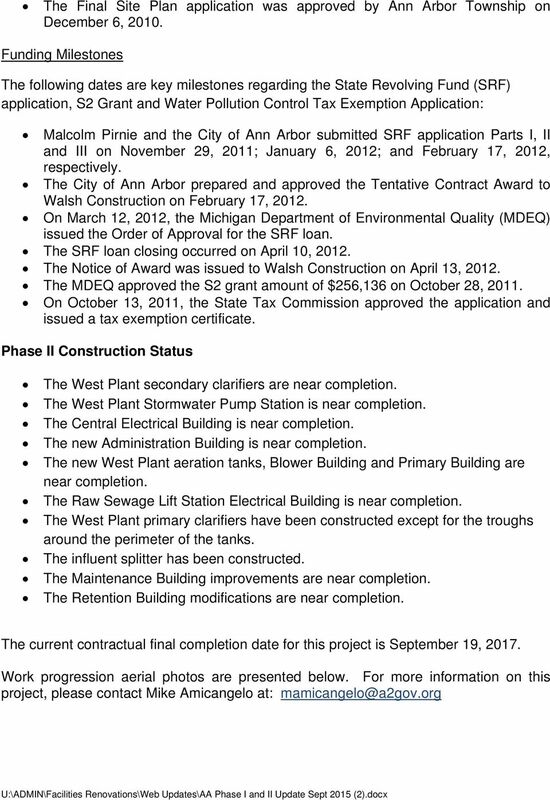 The following is a timeline of the key project milestones to date: A contract with Walsh Construction was executed and the notice to proceed for construction of the Facilities Renovations Project was issued on June 8, The West Plant start-up and commissioning is scheduled to begin in September Regulatory Milestones Important regulatory compliance elements of the Facilities Renovations Project included submittal of the site plan application and completion of the permitting process through Ann Arbor Township, Washtenaw County, the State of Michigan and FEMA. 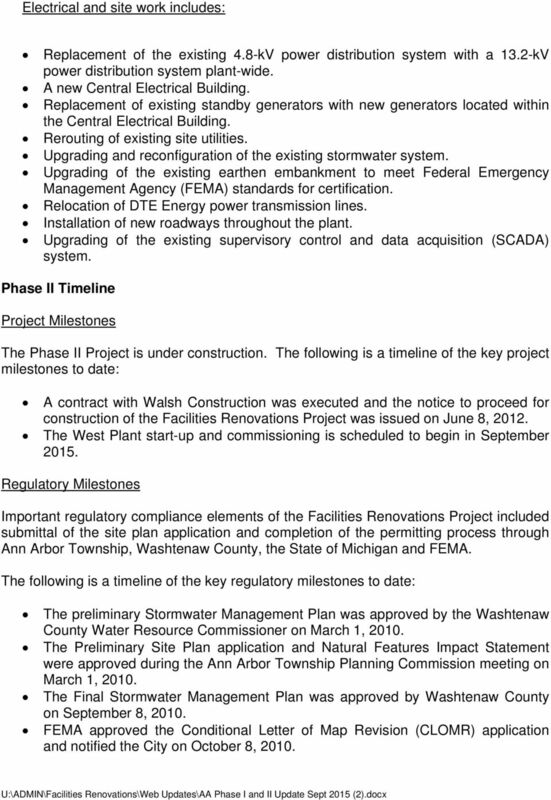 The following is a timeline of the key regulatory milestones to date: The preliminary Stormwater Management Plan was approved by the Washtenaw County Water Resource Commissioner on March 1, The Preliminary Site Plan application and Natural Features Impact Statement were approved during the Ann Arbor Township Planning Commission meeting on March 1, The Final Stormwater Management Plan was approved by Washtenaw County on September 8, FEMA approved the Conditional Letter of Map Revision (CLOMR) application and notified the City on October 8, 2010. 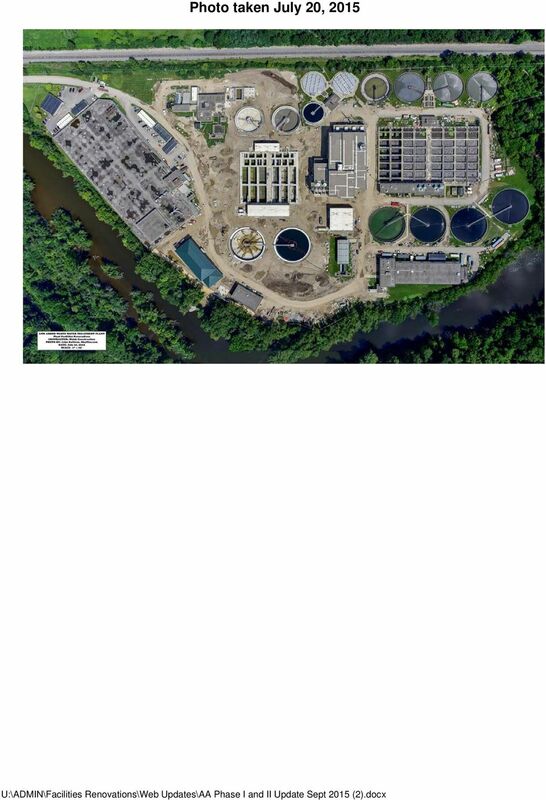 Chapter 5 EXISTING WASTEWATER TREATMENT FACILITIES 5.1 THERESA STREET WWTF 5.1.1 Overview The Theresa Street WWTF is the larger of the two wastewater treatment facilities owned and operated by the City. 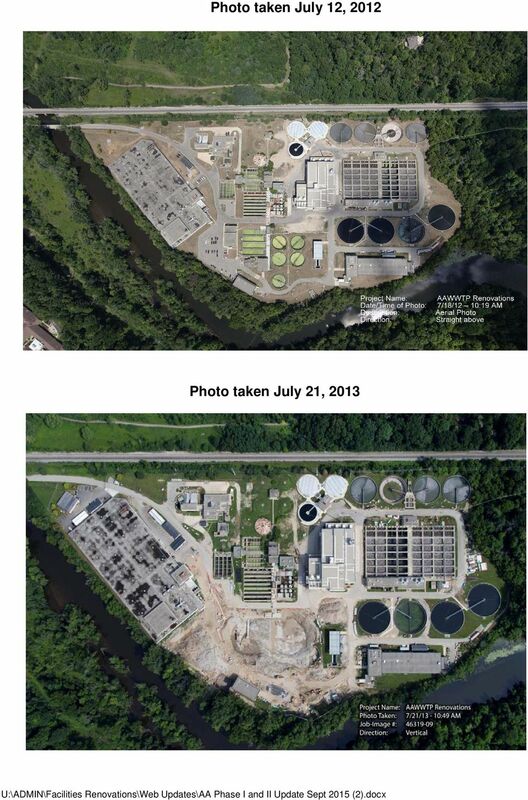 SECTION 1 UTILITY OVERVIEW, INTRODUCTION, and PROJECT BACKGROUND Wastewater Utility Overview In the late 1950 s, the Village of Old Forge began to realize the impacts of dumping sewage in the Moose River.